In November 2017 the hockey world welcomed Mark Recchi, Paul Kariya, Teemu Selanne, Danielle Goyette, Clare Drake, Jeremy Jacobs and Dave Andreychuk into the Hockey Hall of Fame. There was plenty of pomp and circumstance, moving speeches, memories and laughs for all inducted. The 2017 Hall of Fame class had a tremendous impact on the game but as we look forward to a new induction class in 2018 I hope that the Hall of Fame voting class looks at a name long overdue for induction in the form of Willie Eldon O’Ree. 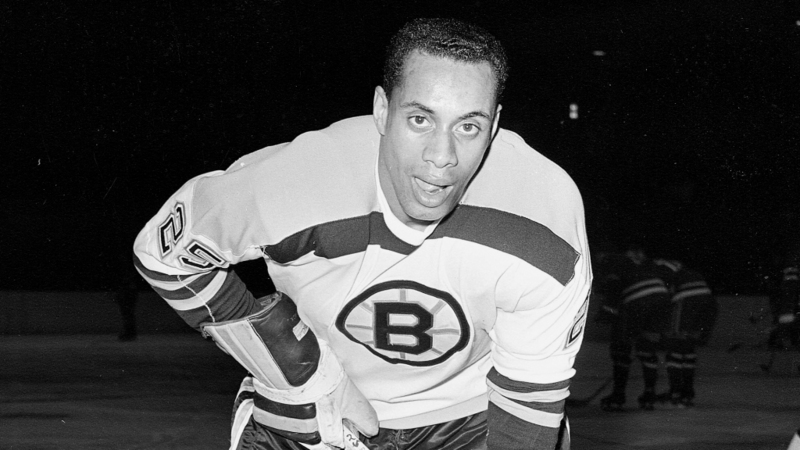 The first black man to step foot onto the ice of an NHL game with the Boston Bruins in 1958 is long deserving of the induction and while his playing career at the highest level of hockey may have been brief, his impact on the game goes beyond the NHL. Let’s be quite blunt. If you’re not well off and white, hockey is a tough sport to get into for a variety of reasons, one of them being cost. As the NHL’s Director of Youth Development (at 82 he’s still going strong in this role) since 1998 he’s been able to bring over 40,000 youth many of them being minority children into hockey all across North America while being the true personification of the fact that hockey is for everyone. 40,000 kids into hockey thanks to Willie O’Ree from places like Brooklyn and urban parts of Washington, DC and Philadelphia, now that’s making a difference in growing the game. Some of these kids have gone onto playing the game at elite levels some just recreationally but, they all got their start thanks to Willie’s help. This is a hall of fame meant to honour all hockey and someone with over 1000 points, 1000 professional games played, the 1969 Western Hockey League scoring title and in a 20+ year career of professional hockey he deserves his due. O’Ree was an icon of the original San Diego Gulls and Los Angeles Blades of the Western Hockey League in the 1960s and 1970s and in 2015 the modern day AHL San Diego Gulls would honour him with a special Willie O’Ree night. In my opinion legends of the AHL and other pro leagues in North America deserved to be recognized in the hall. This may not be a sole reason to put a man into Hockey’s Mecca but look at where else he’s been honoured. Someone honoured this many times over across more than one country for his accomplishments in hockey you’d think would have received his due literally decades ago at the HHOF, right? Every other sports league in the Big Four has inducted their first black player into their hall of fame and his impact on the game is iconic. The Hockey Hall of Fame only has a display tucked away in the corner of the hall to honour players of colour. In my opinion this an embarrassingly small way of saying thanks to breaking barriers to not only O’Ree but other minority icons such as Fred Saskamoose, Larry Kwong, Herb Carnegie, and Art Dorrington. In 2018 this is a plea to the Hockey Hall of Fame Selection Committee, yes have your meetings and discuss who should be apart of next year’s class but, include the native of Fredericton, New Brunswick if not as a player then as a builder. Players past and present from Grant Fuhr, PK Subban and Wayne Simmonds, give thanks to what he was able to accomplish in his career to pave the way for the future of black hockey players. If Hockey is for everyone, then next November we should all be standing up and clapping for the induction of the fourth person of colour at 30 Yonge Street in Downtown Toronto 60 years after he changed the sport forever.